Democratic Party traces its origins back to 1946 to its namesake when Turkey had switched to a multi-party era when dissidents in the CHP founded a new party. This center-right political line later founded Justice Party (AP) and True Path Party (DYP), and founded governments led by Adnan Menderes, Süleyman Demirel and Tansu Çiller. Demirel and Çiller have been party leaders of DYP which uninterruptedly ruled together in a coalition government from November, 20 1991-March, 6 1996. It was in a coalition partnership with SHP and CHP for five years with brief pauses, then with the ANAP between March 6, 1996 and June 28, 1996 and with the Welfare Party between June 28, 1996 and June 30, 1997. It has been the opposition party between June, 30 1997 and November, 3 2002. It failed to enter the parliament after 2002 general elections. 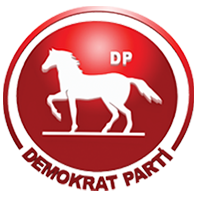 In 2007, True Path Party (DYP), who failed to pass national threshold in 2002, changed its name to Democratic Party in order to unite with Motherland Party (ANAP), another center-right political party. The party failed to pass the national threshold in 2007 and this merger did not take place until 2009. The party had managed to receive only 0.65 percent of the votes in 2011 elections. Its logo is a white horse on red background, as it has traditionally used in similar forms since 1946.